A while back, I picked up a salt-block-cooking cookbook at my favorite used bookstore. No, the store isn't used. Most of the books are, though. I didn't happen to have a salt block to cook on, but I figured that I'd get one eventually, and the book looked really interesting. The book made it very very clear that grilling on a salt block is not for the faint of heart or the impatient. The salt block has to be heated slowly and there's still a chance it can break suddenly. Or even sort of explode. Besides heating the salt block slowly, the other really important thing to keep in mind is that not all salt blocks are rated for cooking. The ones with certain types of flaws are much more prone to breaking and should only be used for serving or for cold uses. 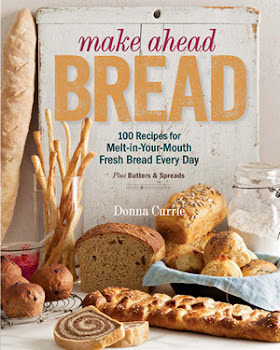 A few weeks after I got the cookbook, I got an email from the PR firm representing a company called SaltRox. And guess what they make? Yup, salt blocks. It was like karma. Salty, savory, delicious karma. I was pretty happy to see that the salt blocks from SaltRox were rated for cooking, and it said so right on their website. Which is great, because I doubt most folks would be able to tell just by looking at the block. I sure couldn't. Since salt blocks are a natural product, you'll always see lines of different colors - that's not a flaw. But it does make them very interesting to look at. While searing a steak on a hunk of salt sounds really interesting, I'm betting most folks would use the block for other purposes, It's lovely for serving, and you can use it for salting or pickling foods. I also saw a recipe for drying food. Or you just display it. It looks really beautiful, and it changes depending on the light source. The thing to remember if you're going to use the block for serving is that it's not a big pink plate - it's a giant freaking slab of salt. So if you put food on top of it, the food will get salty, and the longer it sits, the saltier it will get. The food will also begin to lose moisture, if it's something that has moisture in it. I mean, a cracker isn't going to start weeping, but a slice of tomato will definitely lose water and get salty pretty quickly. I browsed through the book to find something to make that would showcase the salt block, and I settled on a recipe for pickled vegetables. I decided to use zucchini. But when I got to assembling ingredients, I realized that the recipe had a major flaw. The introduction talked about how the olive oil was essential as it kept the salt from being to aggressive. But there was no olive oil in the recipe. None. Zip. Nada. So I decided to have some fun on my own. The resulting zucchini slices were like brined pickles, but done in much less time, and using a much more interesting method. I'm definitely going to be messing around with pickling on the block a lot more, and maybe I'll even make one of the other recipes from the book. The seared scallops looked pretty amazing. Have your salt block standing by. Since the zucchini will release moisture, it's a good idea to have the block on something that will catch the drips. 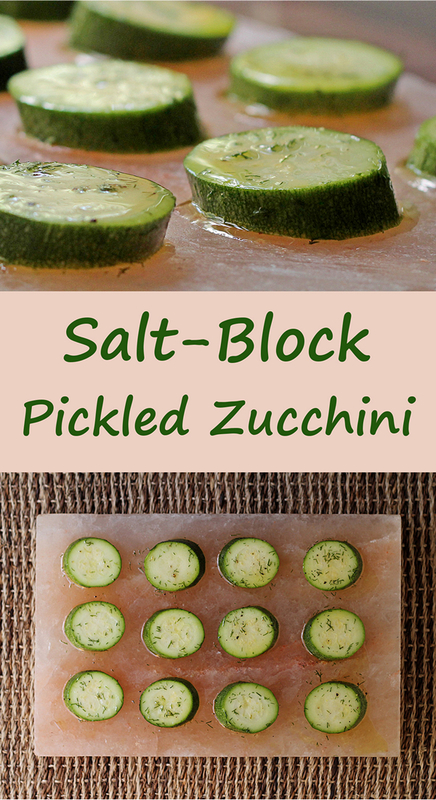 Slice the zucchini in 1/4-inch thick slices. You don't want them too thin, or they'll be too salty. I cut mine on a slight bias, but cutting them into rounds is fine. I ended up with 12 slices which left plenty of room on the block, but it was plenty for pickles to go with dinner. Combine the rest of the ingredients in a bowl and stir to make sure the sugar dissolves. Add the zucchini and stir to coat. 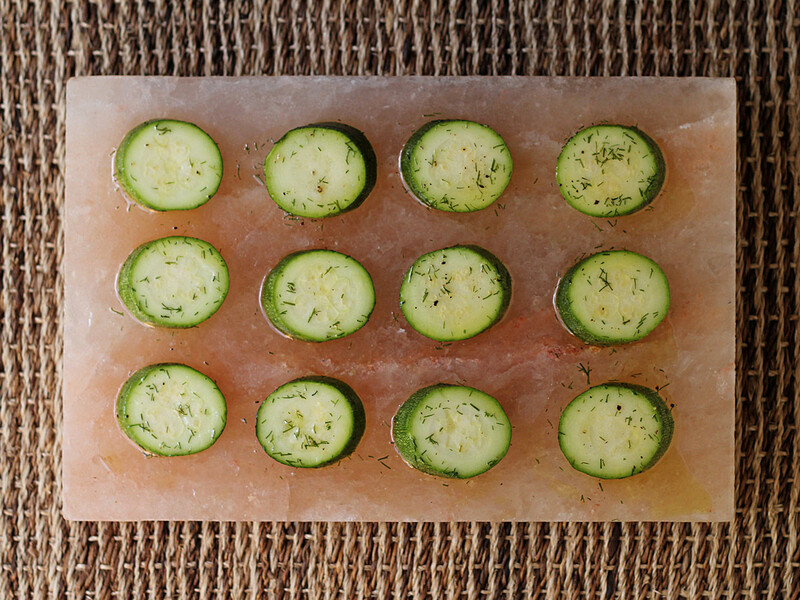 Let the excess liquid drip off of the zucchini back into the bowl, then arrange them on the salt block. Reserve the remaining oil/vinegar mixture. Let the zucchini sit for 15 minutes, then turn them over and let them sit for an additional 10 minutes. You can taste one now and assess the level of saltiness. If you want them saltier, leave them on the block a few minutes longer. Pat the zucchini dry on both sides with paper towels. 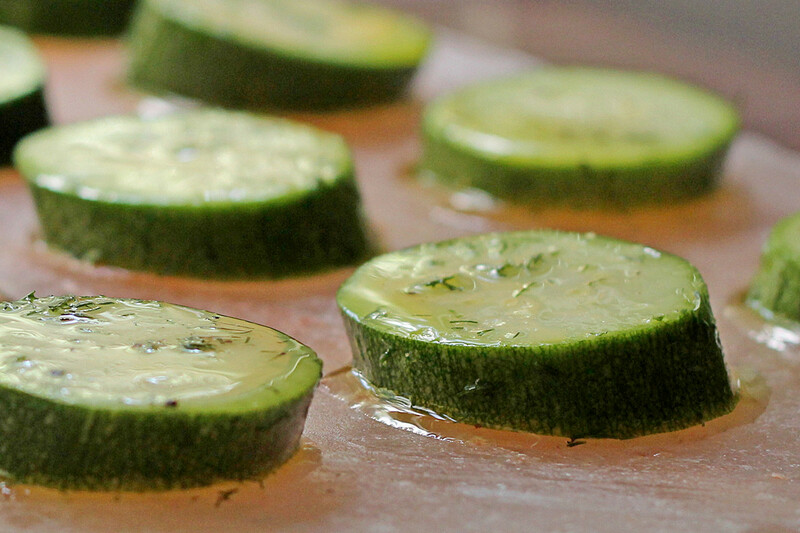 Arrange the zucchini on a plate and drizzle with some of the reserved vinegar and oil mixture. Salt blocks aren't like other cooking surfaces. They get crazy hot and retain the heat. And they wear away when you use them. And you can't clean them like normal cookware. 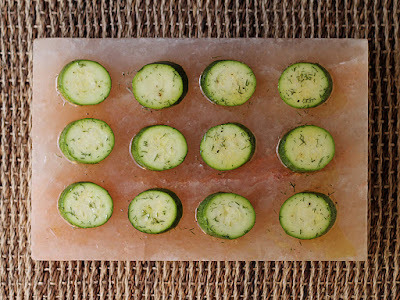 You can certainly scrub a salt block to get rid of baked on food or to remove food residue. But you shouldn't use soap, because the salt blocks are porous, and you don't want soap in your next batch of food. On the other hand, salt is a bacteria-killer, which is why it's used in food preservation. You certainly want to get food residue off the salt block but you don't need to worry about the fact that you can't use soap or shove it in the dishwasher. They're also heavy and can be slippery when they're wet. If your salt block does break, you have a couple of choices. You can still use it with the pieces snugged up next to each other. Or, if it's a small corner that broke off, you can crush it, grind it, and use it like ... well, like salt. And when the salt block has worn away so much that it's no longer useful - or if it has broken into too many pieces - you can bust it up, crush it, and use it to fill your salt grinder. Yup, this is cookware you can eat. I received a salt block from SaltRox at no cost to me for my use on the blog.